New Delhi: Pratham Institute today held a felicitation ceremony for the Grand Finale of “International Finance Olympiad”. Finalists from Delhi, Hyderabad, Bangalore, Dehradun, Mumbai and Sharja competed for the IFO Trophy and cash scholarship of 3,60,00 prize money. 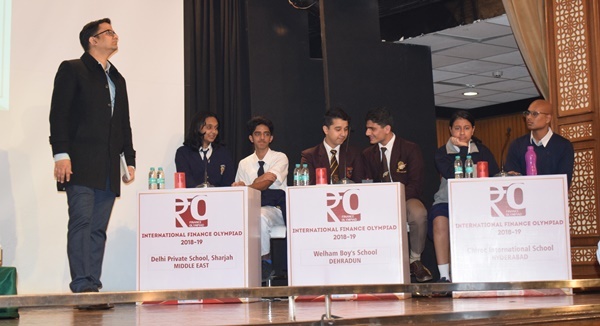 6000 students from 280 schools of 25 cities across India and middle East participated in which Delhi Public School RK Puram won International Financial Olympiad won with flying colours beating other schools worldwide. The Knowledge Partner for the International Finance Olympiad are PRATHAM and the technology Partner was FAVCY. This Olympiad is the Flag ship event of International Institute of Financial Markets Limited (IIFM). With intent to make school students proverbial with the intent of making school students well versed with the art of managing funds and economical conditions of the country, International Financial Olympiad (IFO) is being conducted for past 6 years annually. The National Financial Olympiad which incorporates application from school students from class 8th to 12th was held in first week of February, 2019. “PRATHAM is one of the leading education chains to have sponsored the financial literacy campaign for students at school levels by Sponsoring the International Finance Olympiad. The Olympiad was conducted in three rounds. The first is conducted at the school level during Aug-October. The school authorities select a particular date for a 40 minutes MCQ based test. Students scoring above 60% in the first round are then eligible for the regional round. The cumulative scholarship of Rs 3.6 Lacs is given to the students of which a total scholarship of Rs 1,40,000 will be distributed in the Grand Finale. The winner of the quiz gets Rs 1 Lac, the first runner up and the second runner up gets Rs 40 thousand and 20 thousand respectively. Delhi Public School RK Puram – Won the Grand Finale and Cash Scholarship of Rs 1 LAC. The winning team members were Pratuysh Singh, Deepanshi, Pragyat Agarwal and Pranav Jha. Among the runner up were Smt. Sulochana Devi from Singhania School, Thane, Maharashtra secured the first runner up position and Welham Boys School, Dehradun acquired second position. The Quiz Master for the Quiz was Mr Pranav Chaturvedi. Mr. Pranav Chaturvedi is an alumnus of Shaheed Sukhdev College of Business Studies and Founder of FAVCY.